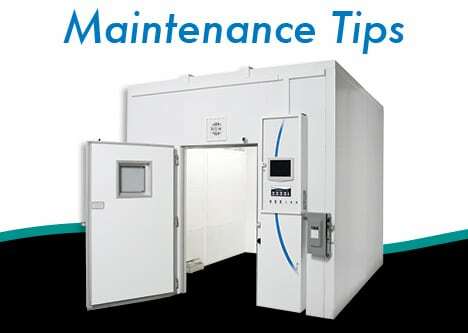 Initial inspection should be performed 3 months after your research chamber is put into production. After that, perform preventive maintenance on a regular basis. Depending upon conditions found during your initial inspection you can determine the intervals at which maintenance checks should be performed. The single most important item to check on your Percival chamber is airflow. Air is drawn through the condenser to cool the refrigerant. On an air-cooled condensing unit, the condenser is at the top right hand side of the chamber. Our series 36, 41, and 66 models have a perforated panel with the letter “P”. On our series 30 models the panel is at the bottom. The condenser coil is behind the panel. This is where most of the dust and debris collects. Percival recommends using a vacuum to remove it. Never use compressed air as this will lodge the dust further into the condenser. When checking air flow on your Percival chamber, also check the operation of the fan. Place a piece of paper in front of the condenser. The paper should be drawn into the condenser. If it is not, turn the chamber off to prevent damage. Another place to check airflow is the evaporator motor which is inside the chamber at the top or at the rear panel. This is a finned coil similar to the air-cooled condenser. Check for dust and debris here also. Use a flashlight to see behind the motor and inspect the evaporator. If cleaning is required, remove the fan panel. Again, use a vacuum to remove dirt. You can check the fan operation in the same way you checked the condenser coil in item 2. Check chamber temperature operation. Set temperature to a low setting with lights on (about 12°C) and see if it maintains for at least an hour. Do the same at a higher temperature, around 35°C. Check power cords for frayed wires. Check for unusual noises, i.e. whistling, rattling etc. Check for unusual odors, i.e. “hot” smell, plastic or rubber burning etc. Check temperature and relative humidity (RH) calibration. If you have a calibrated independent sensor adjust the offsets if necessary. Refer to the owner’s manual for instructions. Ensure the condensate drain line is clear. Flush obstructions with soap and water. Most chambers have the drain line running along the back wall. Cleaning the chamber is important to prevent mold, mildew, algae and bacteria. Approved cleaners are liquid soap, detergent and warm water, Lysol®, Pine Sol®, diluted isopropyl alcohol, and diluted bleach. Never use harsh or abrasive chemicals or acid base materials. If you have a pan type humidifier, it can be removed for cleaning. If mold or bacteria growth persists after cleaning, the growth is probably inside the evaporator or in an inaccessible spot. Removal of the evaporator pan is necessary to disinfect the evaporator coil. Some customers have had success by adding diluted bleach to the humidifier pan and setting the temperature and RH levels high (around 85% at 30°C – 40°C) for up to 6 hours. This allows the bleach water to get into the evaporator and other places that can’t be reached. This method also works with an algicide. If you don’t have a pan type humidifier or yours is behind the evaporator you can place a large shallow pan with bleach water and run at a higher temperature to allow the bleach water to evaporate and circulate throughout the chamber. Thank you for choosing Percival Scientific chambers and incubators. For additional assistance on the care and cleaning of your Percival products, please contact us at service@percival-scientific.com or at 1-800-695-2743.